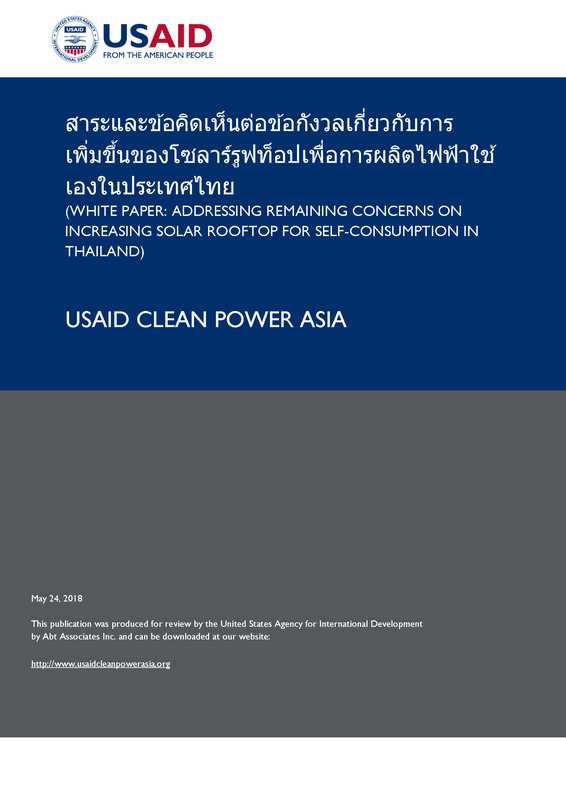 Thailand has recently experienced continuous growth in DPV, with the growing popularity of DPV driven by the declining cost of solar PV modules, an increasing number of players in the Thai market, and thriving business models such as third party financing through private power purchase agreements. In Thailand, as well as elsewhere, increasing deployment of DPV has raised several concerns, including technical concerns about the safety and reliability of the grid and financial concerns about its impact on retail electricity rates and the viability of current utility business models. Several questions on the impacts of DPV remain unaddressed, leading to uncertainties on DPV-promoting policy. This white paper discusses the current concerns of stakeholders, including ratepayers, utilities, policymakers, the regulator, and power producers, and addresses six questions and answers. Please fill the form below; the download link will be sent to your email address specified here. © 2019 USAID. The USAID Clean Power Asia website is made possible by the support of the American people through the United States Agency for International Development (USAID). Its contents are the sole responsibility of the website manager or managers and do not necessarily reflect the views of USAID or the United States Government. All information resulting from data collection and analysis during this project are the property and sole responsibility of USAID. They do not necessarily reflect the views and opinions of ACE and/or ASEAN Member States. This website is hosted by the ASEAN Centre for Energy as part of the cooperation with USAID Clean Power Asia implemented under U.S.-ASEAN Energy Connect. The cooperation was endorsed by the 7th SOME-U.S. Consultation Meeting in Nay Pyi Taw, July 2016.